For those that had the good fortune to know Derry, it would be difficult to believe that he was born in Winnipeg in 1933 weighing a mere 2 lbs. 2 ounces. He was however, to become a giant. After graduating high school, Derry travelled extensively through North America, arriving in Toronto in the early 1950’s where he discovered rugby and rugby discovered a talented second row forward. 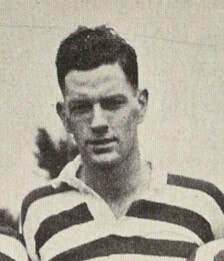 Returning to Winnipeg in 1953, Derry played for the Winnipeg Wanderers and several Manitoba selects teams until the late 1950’s when organized rugby in the province petered out. The Wanderers of the day consisted of many British and French NATO aircrew trainees based in Winnipeg until 1958 and Derry fit in very well with that caliber of experienced players. During the ensuing years, Derry, like other rugby pioneers of the day, participated in many local pick up teams which travelled to various rugby games and tournaments throughout central North America. In 1964, organized rugby in the province began to make a comeback. The Winnipeg Wanderers rugby club was reconstituted largely due to the efforts of Derry and his good friend John Walton; and Derry was instrumental in the resurrection of Rugby Manitoba (i.e. Manitoba Rugby Union) serving as its first President in 1965. Derry continued to play for the Wanderers until 1975 during which time he was selected to play for Manitoba in a 1968 test match versus Alberta. Following the 1975 season, Derry moved to the Saracens RFC in pursuit of more social endeavours but nevertheless played at the competitive second and third division levels over the next 15 years, including many Golden Oldies tournaments. During the Saracen’s New Zealand tour of 1980, Derry basked in the role of Team Manager, serving as resident Club and Union historian, not to mention doing double duty as team choir master. Throughout the course of his life Derry passed on his wealth of experience and enthusiasm for the game and became a fixture of the rugby community with his many social activities and exploits. Who can ever forget those infamous SNAFU corn shucking contests. The onset of cancer was to slow Derry down in his later years, succumbing to the disease in 1993. His contributions to the game as a Pioneer however, have managed to live on through the institutions he helped create, the many players he played with and against, and his indefatigable spirit and love of the game of rugby, on and off the field.